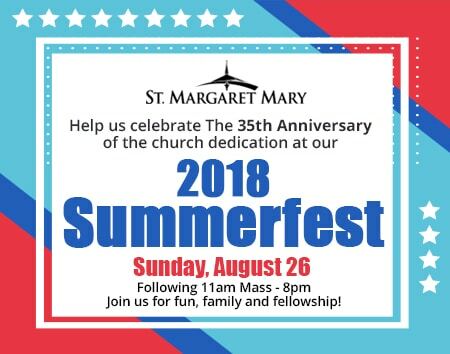 Get your St. Margaret Mary Summerfest Raffle Ticket after each Mass leading up to Summerfest, at the Parish Office, or purchase one at the event itself and you could win $500, $200 or $100 all for just $1.00 to enter! The more tickets you buy– the less it is. Drawing will be held at the Summerfest. Winner need not be present and all proceeds benefit St. Margaret Mary Parish… Enter to Win and Good Luck! And the dedication of our church 35 years ago! 10’x10′ Vendor Spot for $200-$250 (available for your business). Enjoy an all-around great time with Family and Friends! Music, Food, Drinks and Dancing all day and all are welcome! To be held on the Parish Grounds (behind the school). 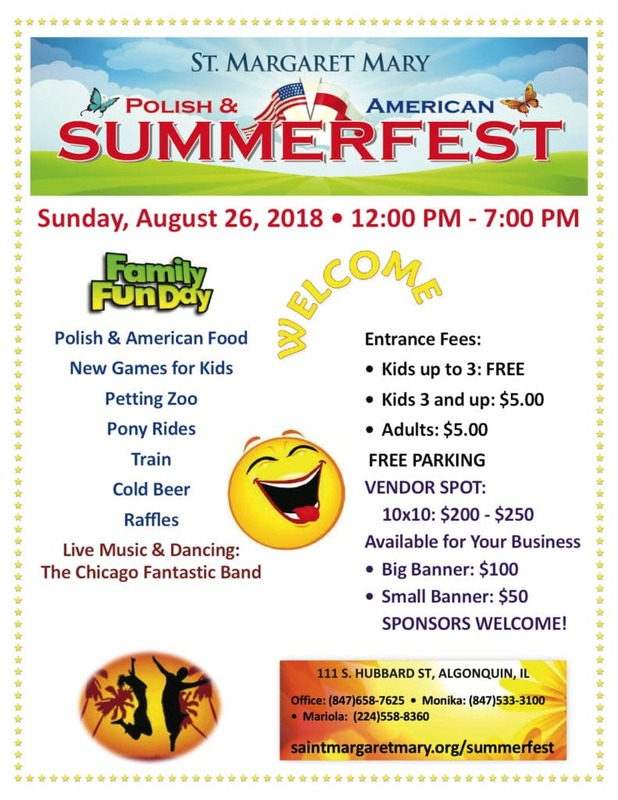 Our Saint Margaret Mary Parish Summer Fest is approaching quickly. This will be the 11th year of this event. It will be Sunday, August 26th from 12 Noon to 7 PM. Our fest first began in August, 2006. It was initiated by Father Edward Staniukiewicz, who put a lot of work and dedication into making it a successful event. He was blessed with many volunteers. Today we can say that it has been a great event for the entire parish and brings a large financial benefit. It also shows the vibrancy, cooperation, and unification of our parish. For certain, it is an event that we must continue. We still need more people in the parish to be involved in organizing and running this event. So, I am asking you for help. On Saturday, August 26th, we need volunteers to prepare the grounds for the festival. On Sunday, August 27th, we will need many hands to work. If you would like to help, please call one of the phone numbers on the flyer (above). The festival is open not only to parishioners, but to neighbors, family and friends. Funds raised from the festival will be used for building up the work of the community of Saint Margaret Mary. More to follow– stay tuned for more festival updates and more!